Some are furious at the cockroach President for blowing off the Paris climate treaty, but many expected that, since it had been one of the few stable goals of his lurching campaign. There is little the cockroach can actually do. Under the treaty’s terms, it remains in effect until at least the fall of 2020, and thus it is sure to become a strong factor in the next campaign. If the cockroach tries to run again, he looks likely to lose. Some political corruption from pandering by the cockroach President will be thwarted by economics. In many places, coal power is no longer cost-competitive, and in some places wind power does not need new subsidies to thrive. The five leading wind-power states–Iowa, South Dakota, Kansas, Oklahoma and North Dakota–all voted for the cockroach, but they are not aligned with his hostile views on renewable energy. Many people in those states now earn their livings from it, while few there are sustained by the coal-power industry. Growth of renewables: The growth of renewables in the U.S. energy supply is a trend decades long. It began with hydroelectric power heavily funded by the federal government during the 1930s. The next surge was wood-fired power from the late 1970s through the early 1980s. Despite later being labeled “carbon neutral,” that has fallen out of favor. Toxic emissions are difficult and costly to control. Outputs have been gradually dropping over the past 30 years. There are now four major U.S. renewable energy sources: hydro, biofuel, wood and wind–in declining current amounts. As of 2016, each one contributed about 2.0 to 2.5 quadrillion Btu per year. Sources still gaining are biofuel–taking off around 2002–and wind–climbing around 2007. Led by ethanol, biofuel is mostly used for transportation. The other renewable sources are mostly or entirely used to generate electricity. Two other substantial renewable sources are solar power and waste burning, both around 0.5 quadrillion Btu per year. Solar began to climb around 2013 and is still in early stages of growth. Waste burning has seen little growth since the 1980s. It spreads toxic pollutants–worse than wood. 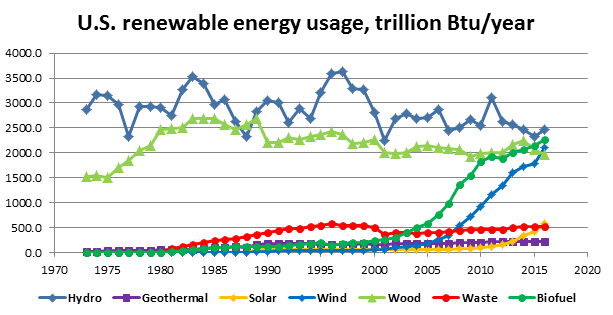 Renewable sources now provide over a tenth of U.S. total energy use: for 2016 about 10.2 out of 97.4 quadrillion Btu. Although prevailing customs do not count nuclear power among the renewables, it emits hardly any greenhouse gases. 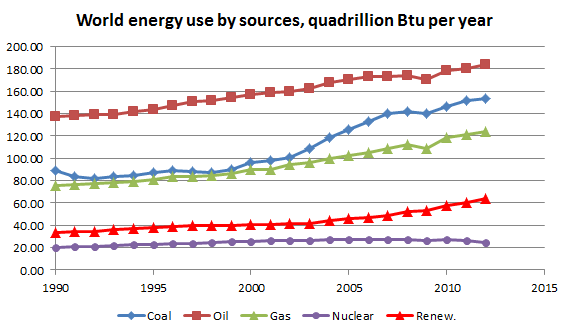 For 2016, the U.S. reported 8.4 quadrillion Btu. It is in decline, with older plants closing and new plants rarely opening. When combined with renewable sources, the United States is now getting about 19 percent of total energy consumption from sources that emit little or no greenhouse gases. Sustainable progress: The dominant influences on renewable energy are now state regulations and local initiatives, not federal programs. They will provide sustainable progress despite the cockroach President, although federal programs could improve outcomes. The most important among the state regulations are renewable energy portfolios for electricity, now enforced in 29 states and the District of Columbia. Governors of several states recently announced they had formed a new organization called U.S. Climate Alliance, intended to promote and organize renewable energy standards. 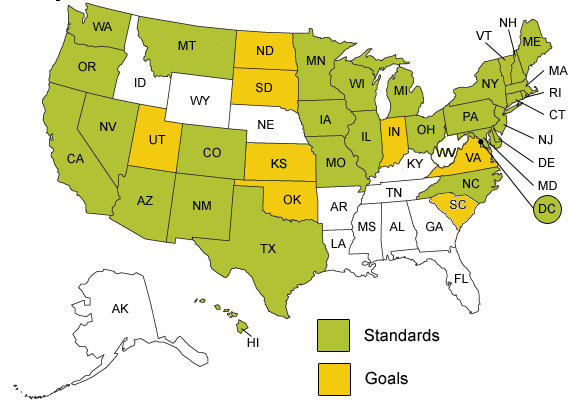 The Regional Greenhouse Gas Initiative–organized in 2003 by New England states, New York, New Jersey and Delaware, and more recently joined by Maryland and Virginia–has provided a durable model for effective state coordination. Despite struggles, the United States continues to maintain a strong record in energy sourcing. As compared with 19 percent of U.S. total energy from sources that emit little or no greenhouse gases, for 1990 through 2012–the latest comprehensive data–worldwide performance remained stuck at 15 to 16 percent. Progress with renewables has been swamped by growth in coal burning by countries of southeast Asia, led by China. This entry was posted in Business, Environment, Events, History, Regulations, Transportation on June 3, 2017 by Craig Bolon.